The third and final round of Health Messaging Small Grants Funding is now open. Some areas have only a small amount a funding available, but we’re particularly looking for applications to work in Central Bradford, Bingley, and Airedale, Wharfedale and Craven. 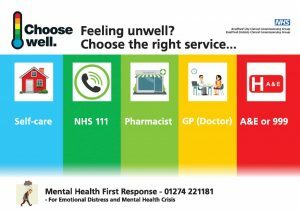 The health messaging model was trialled with A&E Winter Pressures funding (using Choose Well only) in specific hot spots with the aim to reduce inappropriate presentation at A&E. The pilot scheme evaluated with a considerable measure of success and therefore we are now in a position to extend this model across the Bradford City, Bradford Districts, and Airedale, Wharfedale and Craven areas, to adapt/change/expand the messages to cover other key health messages. 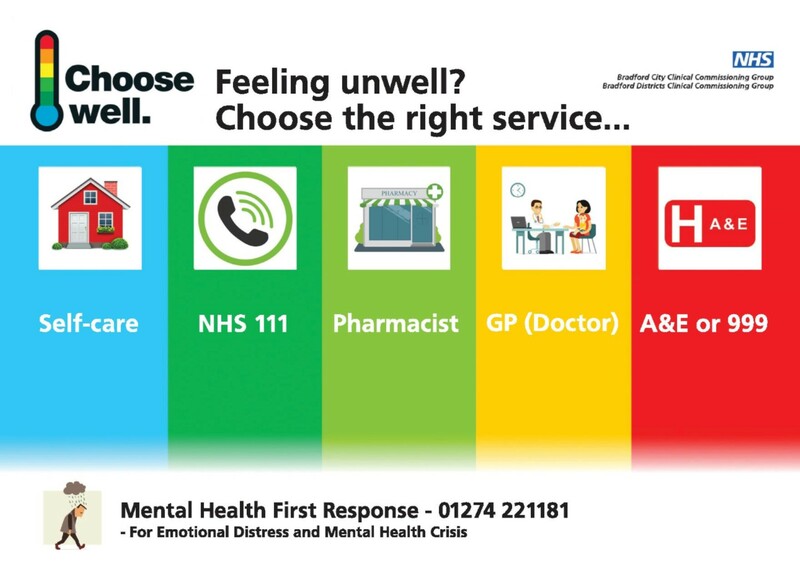 The ‘Choose Well’ message within their local neighbourhoods, cultural groups, and within specific targeted groups. A series of small grants will be allocated to specific community groups to enable these groups to be able to disseminate awareness and self-care messages in the most appropriate approach for their target audience. This will be accompanied by briefing materials to ensure a consistent message. This work will also support communities to build resilience by supporting healthier lifestyles, in their broadest sense. This fund will enable local community groups, as trusted intermediaries, to deliver these messages into their communities themselves. We will equip them with the relevant information in a simple and accessible format, and then empower them to develop the solutions themselves to communicate this information in the most appropriate way for their own communities. Messaging guidance documents have been produced for organisations to ensure a consistent message is delivered. These will be disseminated to successful organisations, along with copies of the postcards. As local priority areas emerge throughout the winter period, successful organisations may be approached by Bradford VCS Alliance to target health messaging activity into specific targeted areas or population groups. 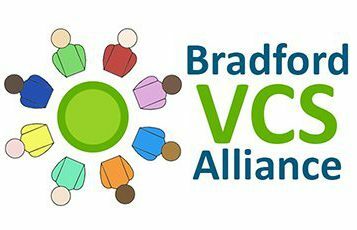 Applications will be assessed by Bradford VCS Alliance. The assessment will be based on how the group is planning to communicate the key message to their target group, and the numbers of people they expect to reach. The deadline for this second round of applications is Monday 21st January 2019 at 12pm. Local community groups will be able to apply for £250 – £750 to support their own approaches to delivering this important information to their own communities. Organisations can apply for more than one grant if they have access to a number of different community groups. This could be running community meal or events to help promote appropriate choices for accessing health care, or to support and resource individuals to promote the message at existing events that their community may already deliver e.g. a lunch club for the elderly, or a Parent and Toddler Group for parents of young children. The key focus is for local community groups to have an ownership of the opportunity. Budgets for each Community Partnership area have been allocated to ensure a spread of activity across the region. The project will run until the end of March 2019. Their self-reported understanding of how to appropriately access different types of health care.